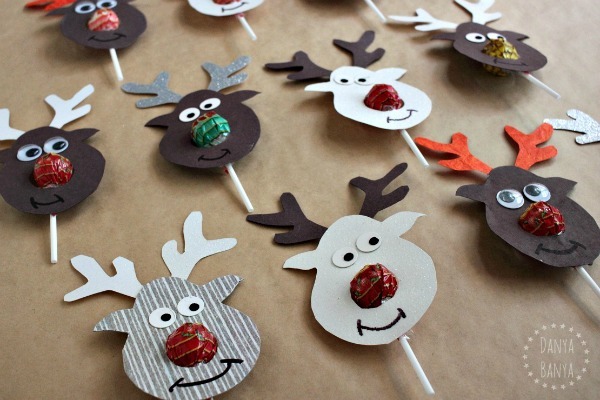 How to make cute reindeer lollipop class gifts for Christmas. They actually weren’t that hard to make – it’s one of those projects where you can set up a bit of a production line. 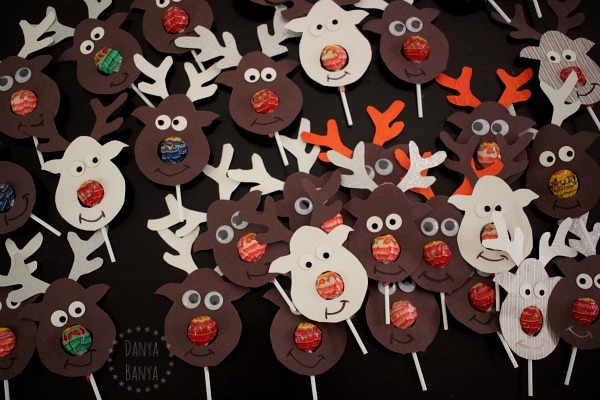 JJ’s last day of school isn’t until this Wednesday, but we gave these reindeer lollipops out to JJ’s kindergarten classmates a week early, much to all the kids’ delight! This post contains affiliate links to similar products used. 1. 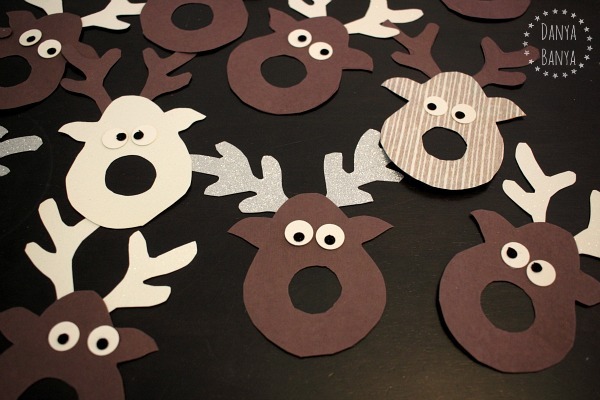 Draw and cut out a template of the reindeer face and one antler. I drew my templates by hand on thick cardboard (recycled from the cardboard back of an art pad). Originally I made the antler template with five points, but I soon realised that a three pointed antler is MUCH easier and quicker to cut out, whilst still looking very effective. Also just FYI that you only need one antler template, because you can flip it over to double as the mirrored template for the other side. 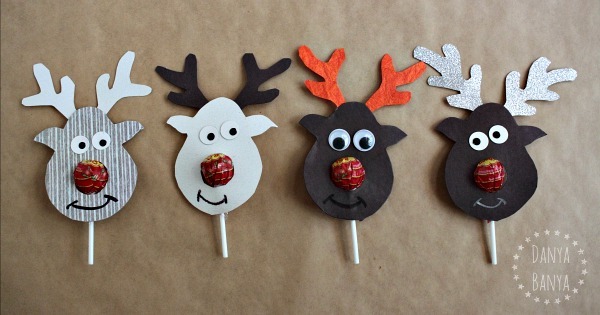 I made the reindeer face slightly pear shaped, with two little ears and a hole for the nose. 2. 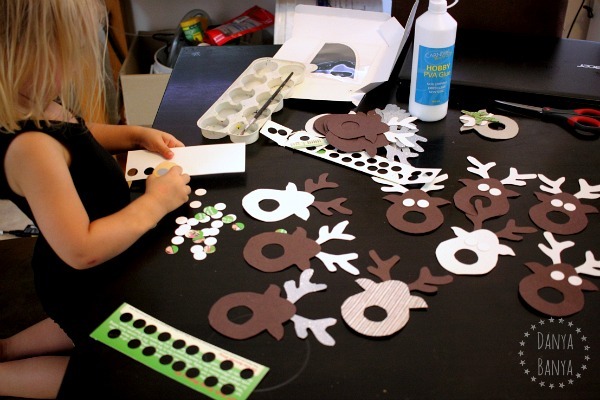 Trace and cut out reindeer face and antlers in cardboard of contrasting colours, patterns or textures. Cutting everything out is the most time consuming step in the whole process – so you might want to spread it out over a few sittings. Older kids could probably help too. 3. 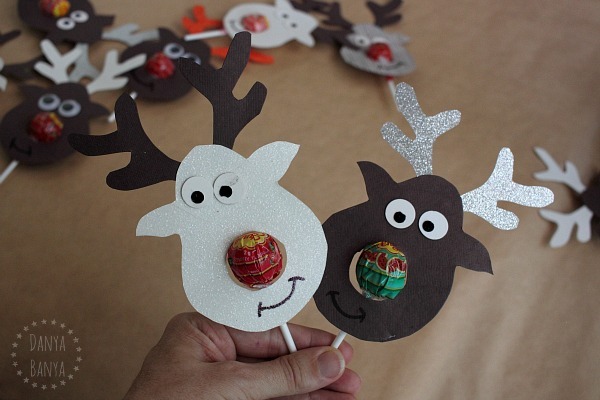 Attach the antlers to the back of the head with sticky tape. I added large googly eyes until, alas, my stash was all used up! I didn’t have time to duck to the store, so I came up with another plan… I remembered that I did have a 1.6cm (5/8 inch) circular hole punch in my craft cupboard that could work, so Bee and I punched out some white circles and glued these on. 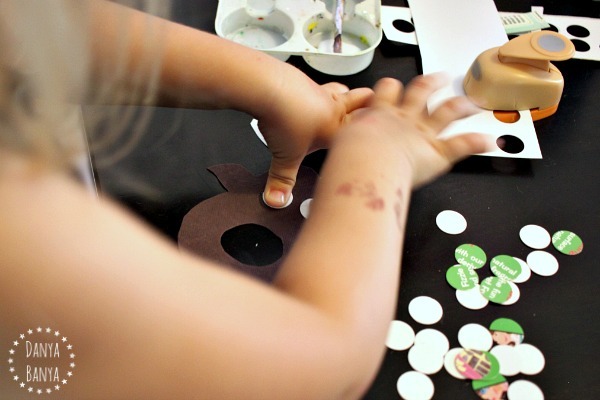 Then I used a regular-sized hole punch to cut out small black circles, and glued these on as well. Some of Bee’s eyes are glued on a little wonky, which I love! 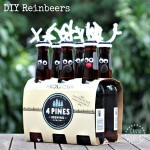 I think it makes the reindeer look quirky! 5. Draw on a smile. 6. 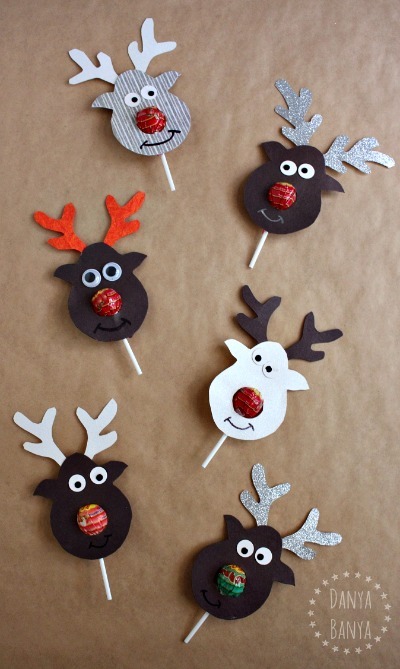 Stick a (preferably red) lollipop to the back of the reindeer face with sticky tape. 7. 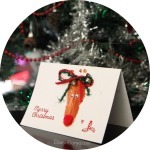 (Optional) Add a Merry Christmas message on the back using a white self-adhesive label. And then repeat x 30. 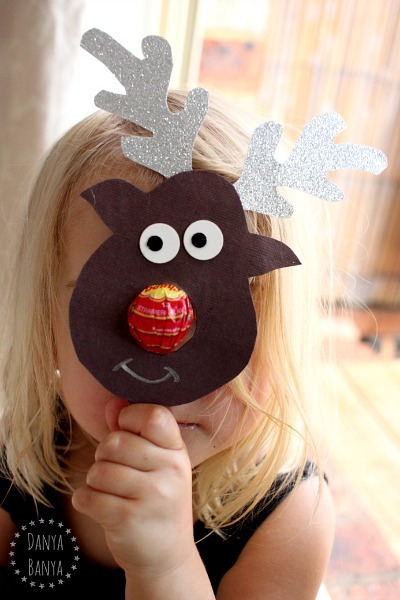 Bee thought they could make a good Rudolph the red-nosed reindeer mask too. Whadiya think? Pretty cute, huh! Also the hypocritical part of my brain wants to justify the refined sugar by pointing out that at least these lollipops have no artificial colours. And given that they are only 12 grams each, they can be considered a ‘special occasion’ treat, can’t they? We gave these melted pony bead ornaments to close friends and family last year, and I’ve spotted some on their Christmas trees this year already! We made these pine cone trees only a few weeks ago. We’ve given a couple of way, but there’s a few that we’re saving for some of our friendly neighbours. 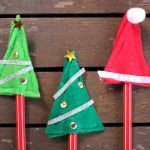 You can find all our Christmas ideas for kids here. 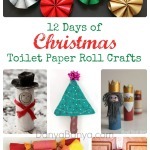 You might also like to check out our Merry Christmas or Danya Banya boards on Pinterest. Or, of course, you can always subscribe to our newsletter, and receive all our latest ideas straight in your Inbox. We’d love to have you join us! 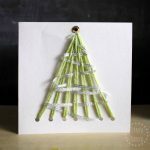 Are you doing class gifts this year? Too much? Or a kind gesture? I’d love to hear what you think! And wishing a very Merry Christmas to all of JJ’s class – hope you all have a fantastic break. See you in 2016! * This post contains affiliate link(s) to similar products used. An affiliate link means I may earn advertising fees if you make a purchase through my link, without any extra cost to you. Thanks for your support. 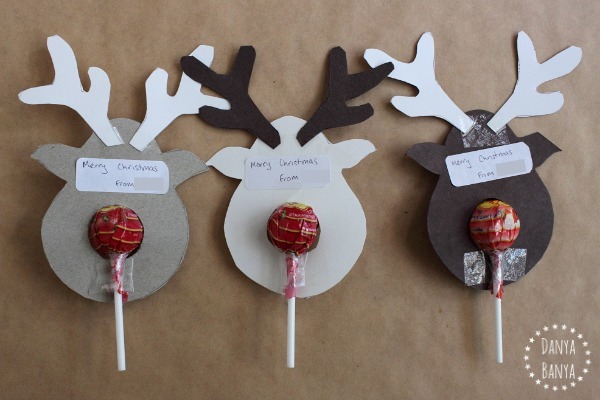 These are fun to make – they ate a hit at our place. Oh, that's made my day! 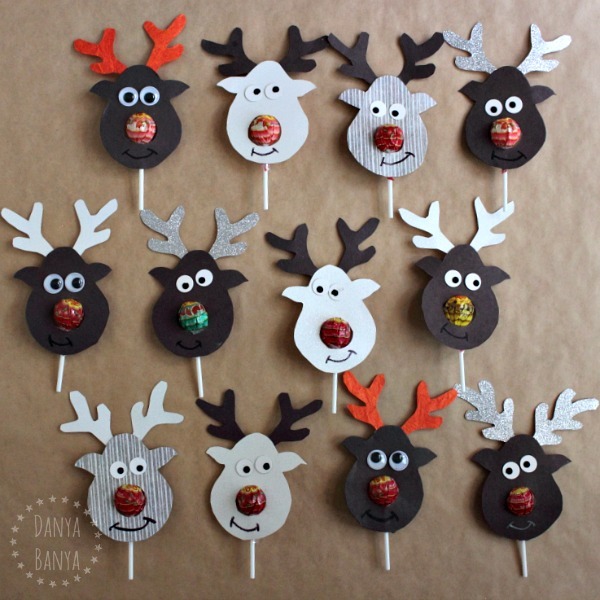 I absolutely love these reindeer! I’m getting on early start on my Christmas gifts. 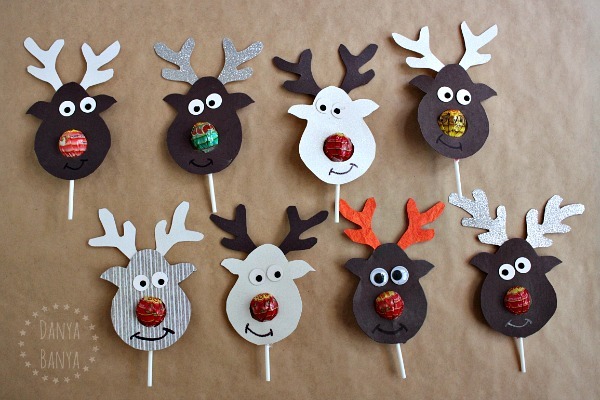 These will be so cute for my grandson’s daycare class. Thanks!